Awards are always very special. They are an appreciation of our work and an expression of admiration and acceptance. I always feel excited and humbled whenever I am nominated for any award. For the past few weeks, my blogger friends and community have been very generous in nominating me for some beautiful awards. I am so overwhelmed. Please bear with me and actually why not join me in my excitement, while I collect all those beauties. 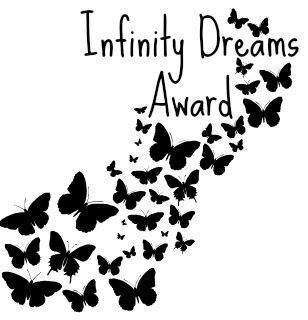 First of all, I would like to thank Sandhya who nominated me for the Infinity Dreams award. Sandhya hosts a delicious blog Indfused. An architect by training and a foodie by passion, she takes us into a delightful journey of Indian and fusion cooking. Her recipes are accompanied by beautiful pictures and her blog is a must visit. According to the rules I am supposed to list a few of my dreams and nominate 7 blogs. All the delicious food in the world should be free for the poor and calorie free for the rich. On a serious note,I dream of a world where there is no envy,no hatred,no disease,no disparity,no pain. In other words a world full of love,faith and everlasting peace. I thing that is what heaven is all about. 😊😊😊😊😊😊 Happy you got the award! Thank you Elaine ☺ Thats every ones dream right. Dream of a blemish free world!! I love it thank you for the nomination.i humbly except. Congratulations on your well deserved award. Thank you for nominating as well. Congrats 🙂 Enjoyed reading about the dreams. That’s very sweet of you. Have a wonderful week. Hugs. Thank you Teagan. Hugs and regards to you as well.